You are deep into wedding plans, and your husband-to-be announces that he wants something in the wedding that reflects his style and personality. As the bride, you probably have been planning this day since you were a little girl, and this request could send your perfect plans into a tailspin. Don’t despair. An age old British tradition is the perfect solution to including your Groom in the planning, without your wedding becoming a beer and pizza affair. Your solution to the scary request to fit your man’s style into your perfect wedding is a Groom’s Cake. The groom’s cake is a tradition that reaches back to Victorian Britain. During this time, weddings traditionally had two cakes. The bride cake, which is the traditional light and soft cake with icing. Guests at a Victorian wedding would enjoy the bride cake after the wedding, as part of the celebration or “reception.” The groom’s cake was heavier, often a fruit cake type of pastry. Filled with chunks of fruit, berries, and liquor, this cake was cut up, boxed and sent home with guests. A party favor of sorts. Tradition also says that single women were encouraged to sleep with the cake under their pillow so that they would dream of their future groom. This is where the groom’s cake gets its name. Today, the tradition of the groom’s cake has changed a bit. For starters, single female guests don’t need to sleep with cake under their pillows, and fruit cake isn’t popular for weddings. 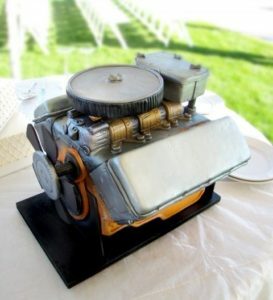 The groom cake does still have a place in the modern-day wedding, and can serve as the detail that showcases your groom, and the things that he loves. The groom’s cake is a departure from the standard wedding cake. Often it looks more like a kid’s birthday cake, frosted with bright colors, in crazy shapes, with themes like football, fishing, hunting, golf, or his favorite sports team. Some grooms choose to mimic the bride cake by keeping it simple and doing a smaller version of the traditional cake, frosted in chocolate or a color other than white. Cake flavors, keeping with the tradition, are usually heavier flavors like chocolate or coffee, and may have fruit fillings or be baked with liquor. Your baker will work closely with your groom to make sure that this cake fits his vision, and is the perfect design and flavor to fit his tastes. You have some options for when to serve the groom’s cake. Make sure that you get his input into this subject, to avoid any hurt feelings. In some cases, the bride and groom choose to serve the groom’s cake during the rehearsal dinner. Since the rehearsal dinner is traditionally put on by the groom’s family, this may feel like the most fitting time to serve the groom’s cake. It is also a good option for the rehearsal dinner if a dessert for the meal has not been planned. If serving the groom’s cake at the rehearsal dinner is not an option, the other time to serve this cake is during your wedding reception. Many couples place the two cakes together on one table. Because the two cakes will be different flavors, once you’ve done the traditional cake cutting, your guests will have options on the type of cake they can enjoy. There is still the option to use the groom’s cake as a take home for guests, just make sure that you provide boxes to pack the cake in. 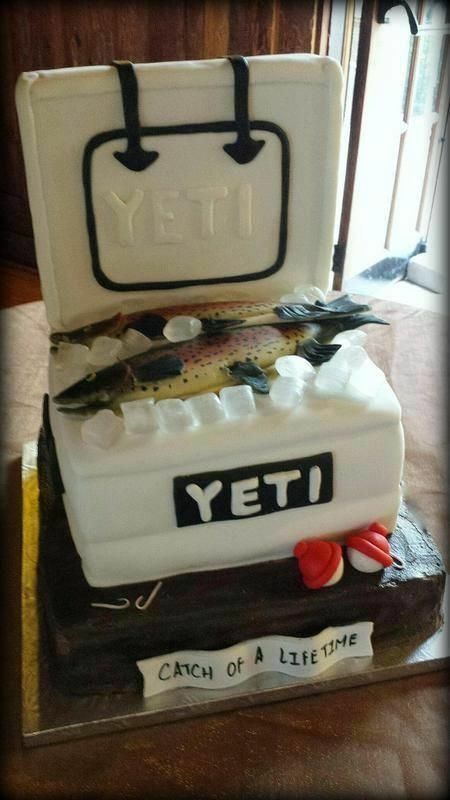 A groom’s cake is the perfect way to add your husband-to-be’s style into your wedding. 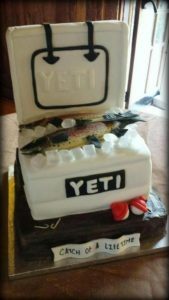 Not only does it showcase his favorite things, but it can give your guests options for different cake flavors, or it can be the dessert for your rehearsal dinner. The wedding professionals at the Platinum Banquet Hall are here to help if you need advice on how to incorporate a groom’s cake into your reception plans.